With just five post-split league games remaining, McIntyre’s men are staring relegation in the face. This was their seventh consecutive Premiership defeat and, coupled with second-bottom St Mirren picking up a point at Hamilton, Dundee are now three points adrift at the foot of the table. 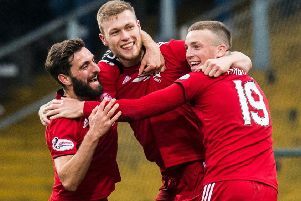 Sam Cosgrove’s second-half brace won the game for Aberdeen who celebrated their 12th successive win over their Tayside opponents. With one solitary home win to their credit this season, Dundee must somehow find a way to stop the rot but confidence is ebbing at an alarming rate. The bottom club weren’t lacking any fight and had to endure the agony of hitting the woodwork in 36 minutes. Ethan Robson watched his left-foot half volley strike the outside of Joe Lewis’ far post after Cosgrove could only partially clear with a header. There was controversy four minutes before the interval. Connor McLennan’s cross appeared to be handled by Paul McGowan, the Dundee skipper, prompting a furious reaction from Aberdeen manager Derek McInnes though referee Andrew Dallas dismissed the appeals. 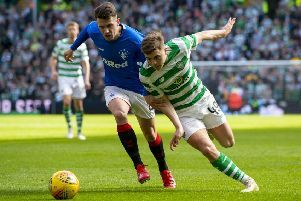 The second-half was just as scrappy but the visitors went ahead from the penalty spot when Niall McGinn’s pace and trickery on the counter-attack was too much, luring young Callum Moore into a moment of recklessness. Cosgrove stepped up suitably confident of finishing the job off and sent Seny Dieng the wrong way. The striker made sure with his second 13 minutes from time. McLennan’s surging run was matched with an astute cross for his team-mate who exuded calmness to roll his finish past Dieng from eight yards for his 20th goal of the season.